New X20 20° Head Design! Not Just New ... Revolutionary!! After A Year Of Testing We're Ready To Introduce To The World Our New And Exclusive "X20" Design Cylinder Head And Custom Engine Package. Unparalled High RPM Stability With Its' Exclusive (1) Piece Stand Shaft Rocker System And "Clean Sheet Of Paper" Redesign Over The Currently Popular 20° BBC Cylinder Heads Out There. A Completely New Valve Arrangement In The Combustion Chamber Not Only Allows For Bigger Intake And Exhaust Valves But Also Reducing Any Cylinder Wall Or Exhaust Valve Interferance that Normally Results In An Airflow Restriction. The End Result Is An Extremely Stable Cylinder Head That Accelerates Off The Line And Off Gear Changes To Produce Quicker ET's Over Engines With Similar Peak HP Numbers. 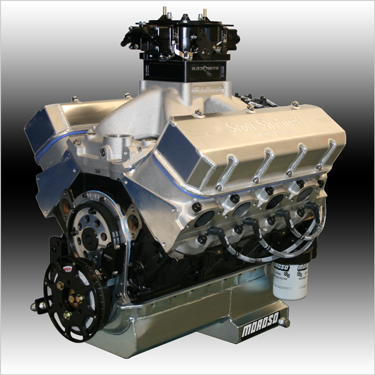 More Power, Better Valve Train Reliability And Increased Torque Where It Counts. The Best Part Of This "Trifecta" Is That It Comes To You At Virtually No Increase In Cost! !